The other day, a colleague walked round to my desk, and as he was looking over my shoulder at my screen said “There’s a bus in the river”. And so there was! A big yellow one. By the time I had fiddled with my phone to take a picture, it had already disappeared behind the building across the road. So we couldn’t prove that it had been there, and no-one believed us. Then yesterday, I googled up river Lagan and bus (or something like that), and found this article. Just as I was pointing out to everyone in the office that we hadn’t imagined it, and that we weren’t mad, someone said “There it is again!”. So we rushed to the window with our phones, and I did manage to get a picture this time. I am fully aware that the picture is of miserable quality, but it was taken from a phone, in a hurry, through dirty windows, in the rain. 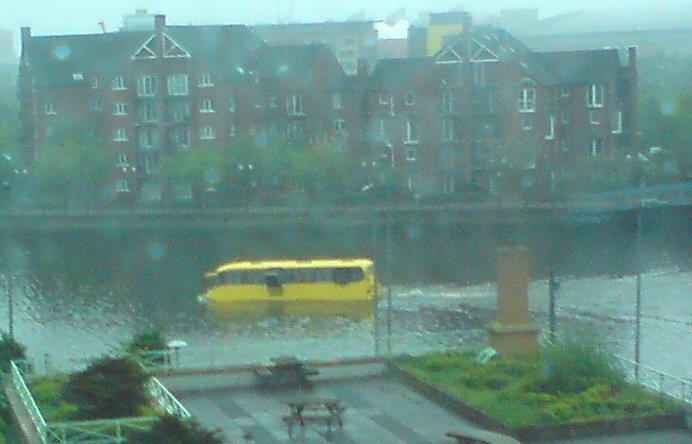 But it does show how bizarre is looks to see a big yellow bus travelling along the river Lagan. That the quirky and fun music from A town called Eureka and the very serious music from Battlestar Galactica are written by the same guy, Bear McCreary? That’s quite a broad musical spread. He’s a clever chap. Of course, unless you also watch quite a bit of Sky One, this will mean nothing at all to you. This is very late. I saw the film of Watchmen weeks ago. I had intended to write something about it at the time, but I never got round to it. But it was so good that I still feel I ought to say something, even if it has taken far too long to write. It’s a film that could well defy expectations. It is not an action movie, though it does have some action sequences. This is not a typical superhero movie, though it is about costumed crimefighters. Perhaps it is more about philosophical or sociological worldviews than anything else. One hero fights against evil because he hates it, but not through any real love of goodness. Another wants to save the world, but again, not through any real love of people; perhaps more for the intellectual challenge of it. Another is ambivalent, dissociated from the world because of his power – he is described throughout as god-like, but only when he learns to love can he be described as like the kind of god we would want to know. That still leaves two characters, about which I don’t have a lot to say, other than maybe they could be described as normal, the sort of people we can identify with, or would want to be most like. The move is visually arresting, filmed with what I guess is an artist’s eye. The soundtrack is wonderful – instead of background music to reinforce the action, at times the action stops to allow the music to become the foreground, and to set a specific tone for the scenes to follow. The plot is complex, with key scenes told through flashbacks, and follows the original comic book until near the end. I hope I haven’t given away any spoilers. I really liked this film, and I would hate to spoil it for anyone else. But I would recommend it to anyone who was comfortable with 18-rated films, and was able to cope with some unpleasantly violent scenes. I found the journey to be worthwhile. This month saw the re-launch of Wired UK after being absent from our magazine racks for a long time. I first came across Wired magazine a good few years ago, on holiday in America. For those not familiar with the magazine, it is kind of a commentary on the society that our technology creates as much as it discusses the technology and the science behind it. So although it talks quite a bit about science, computers, and the internet, it’s more about the people behind these sorts of things, and about the society that may result from them. The UK edition was spun off from the US, ran for a while, and then closed down due to diminishing readership. I’m guessing that the plans to restart a UK edition were made prior to the current financial turmoil, as otherwise it seems like a really bad time to relaunch something that has already failed once. So what did I make of the first issue? Well, I should admit up-front that I’ve always liked Wired. Although it can get a bit carried away with itself sometimes, I’ve always enjoyed its positivity and enthusiasm for the opportunities that are created by our technology. And I like how it casts its net widely, and covers a broad range of subjects, some of which can be pretty blue sky. The first UK edition contains mainly stuff that is fairly in keeping with the US edition. The article about Elon Musk was interesting, as was the article about a financial formula that is being blamed for the current economic woes of the world. The story of the salvaging of the Cougar Ace has appeared before in the American magazine, but was worth reading again. The predictions of their futurologists is classic Wired – interesting speculation, but fairly lightweight. Even more lightweight was the piece by Alain de Botton about driving a digger – at only two pages including pictures, they didn’t really get their money’s worth from him. The most distinctively British piece was the story of the BBC IPlayer, and the guy behind it. All in all, I liked it. It told some interesting stories, gave me some things to think about, and at the discounted subscription rate (£2 per issue), it was good value for money. As a side-note, the Register reviewed the same magazine here. Not unexpectedly, they didn’t like it much, since Wired and the Register are more or less polar opposites in terms of how they view the world. And if you fancy checking out some of the content, you can have a nosy here. It was my birthday on Saturday. I had a great day! I had a lazy lie-in. It was a nice sunny day. I went for a long cycle and didn’t get rained on, or any punctures. I was able to buy a nice apple at a roadside stall, to get rid of the taste of the fly that I swallowed. I had toasted Nutty Krust for lunch (the best toast known to man). I watched on old Doctor Who DVD in the afternoon (The Invasion of Time). I went out for tea with an old friend. And then we went to see Monsters vs Aliens in 3D. As I say, a great day. I was out on my bike this morning. And a wonderful song came up on shuffle on my ipod. So I thought I would share it with y’all. Just in case there is any doubt that Bob Dylan is one of the greatest lyricists that ever lived (and I know of no such doubt, but just on the off-chance), may I draw your attention to “A Hard Rain’s A-Gonna Fall”. Not being an extreme Bob Dylanophile (which sounds like one of those bizarre creatures that live in volcanic vents in the ocean floor), I don’t know a lot about the history of the song or anything. But rather than me regurgitate a wikipedia article to you, I’ll just add a link to it later on, and we can both read it together. Anyway, the song describes the journeys of a young man who has been travelling, and returned home to his doting parents. The parents question their beloved son on his travels. “Where have you been, my blue-eyed son?” they begin. He tells them of a number of faintly disturbing places. Trying a different direction they ask “What have you seen?”. He describes the sights he has seen, which are even more unpleasant than the places were. The parents try again with “What did you hear?”. Mostly that’s the sounds of sorrow and pain. In desperation, they ask “Who did you meet?”. Unexpectedly, there is some good news here, but not much. After each verse, the chorus warns that “A hard rain’s a-gonna fall”, which I always think of as my favourite musical prophesy of doom. It doesn’t say much about this rain, but given the overall tone of the song, I think we can assume that it isn’t going to be good. Then comes the final question – “What’ll you do now, my blue-eyed son?”. I suspect that my own answer might be “I’m going to stay right here, and I’m never going back out there because it’s all horrible” (obviously re-worded a bit to make it fit the tune). But Bob Dylan’s answer is “I’m going back out before the rain starts to fall”, and describes all the horrible places where he is prepared to go. Having seen the horror of the world, he does not turn away from it, but instead goes out to do something about it, while he still can. This last verse always challenges me. As a post-script, I should admit that this morning I didn’t listen to Bob Dylan’s original version of the song, and instead was listening to the version recorded by Brian Ferry and/or Roxy Music (I’m never quite sure which). I like this version because of its richer instrumentation, and the fact that it goes along much more quickly, which keeps your attention better for what is otherwise quite a long song. However, it does miss out the “who did you meet” verse, which has the excellent lines “I met one man who was wounded in love, I met another man who was wounded with hatred”, which is beautifully symmetric. And finally, some links – you can find a version of the song on youtube to listen to here (though I warn you the video is awful, and the song has been editted in some way), the original lyrics to read here, and that wikipedia article is here, but it doesn’t say a great deal. After a couple of weeks of not cycling, I got out on my bike today, and went out the Comber Greenway. I happened to meet up with the walking group from my church, who were walking that way today. And I didn’t get wet, which is always nice. But that’s not the exciting bit. 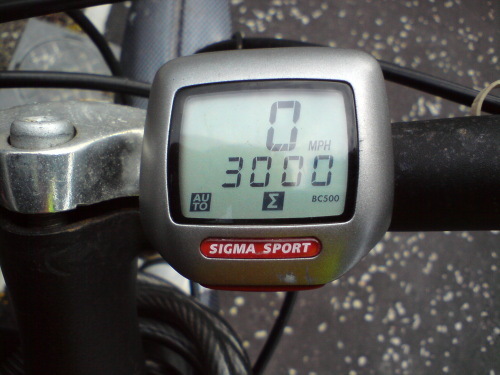 The exciting bit is that I cycled my 3000th mile on my bike. For the first 2 years, I managed to do 1000 miles per year. It’s taken a bit longer to get to 3000, but I’m still very pleased. I got my bike a 3 years ago on the basis that it was finally time to do something about the fact that I was getting old and unfit. The age I can’t do anything about, but the fitness I have managed to do something with. Just watched the final episode of Being Human, BBC 3’s latest attempt at fantasy drama. And I rather liked it. The setup of a vampire, a werewolf and a ghost living together in a rented house in modern day Britain was enough to get me to watch the original pilot months ago. I thought it showed potential then, so I caught the full series. There were some casting changes, which initially just confused me, but otherwise the show remained very similar to the pilot. It’s the sort of thing that probably fitted very well on BBC 3 – not quite mainstream or expensive looking enough for BBC2 – maybe BBC3 does have a purpose after all. As the title implies, the overall theme of the show was what is means to be human, viewed through the eyes of these three outsiders, who are no longer quite human, each in their different ways. They didn’t spend a lot on special effects, as the show wasn’t really aiming to look flash (especially the werewolf effects) – it was much more about the characters, and their situations. I wouldn’t go as far as to say that it was thought-provoking, but it did explore a few interesting ideas about belonging, and people, and stuff. I liked it. I hope it gets re-commissioned for a second series. And I would recommend you catch it if and when it gets repeated. You are currently browsing the Destroy All Onions! blog archives for April, 2009.